After implementing Google Play for Education in their schools, educators assess the devices they chose for their technology programs. While no two educational technology programs are the same, one planning question influences them all: Which device will best serve students’ needs? In the free recorded webinar “Getting Started with Google Play for Education,” K–12 experts discuss three devices they’ve used to implement Google Play for Education in the classroom. Learn how each device benefits students and faculty, and then register for the free recorded webinar to learn more about Google Play for Education. 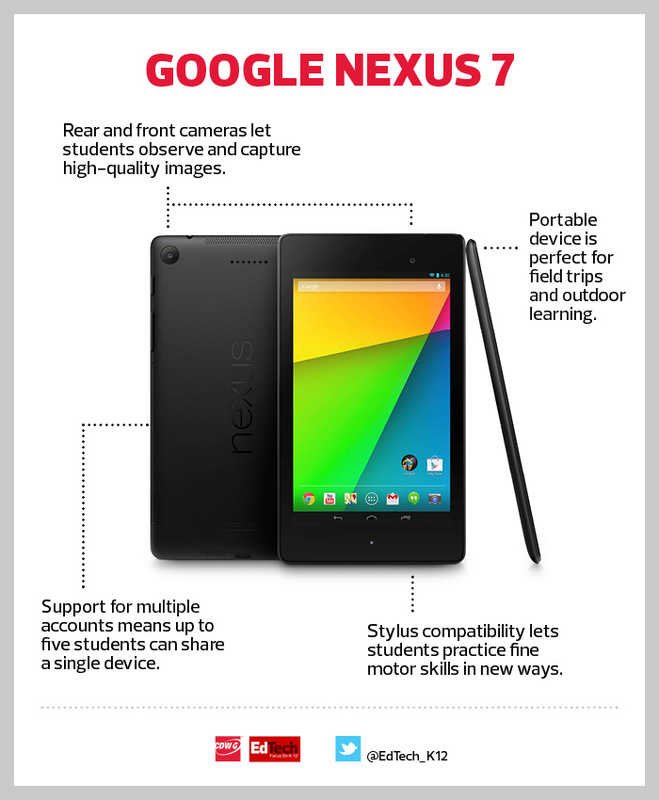 With a microphone and a headset port that let students create and listen to content, front and rear cameras that capture images on field trips, and instant startup capabilities, the Google Nexus 7 tablet is perfect for students across all grade levels. “Some of the things that really excited us about the Nexus 7 and Google Play for Education is the differentiation that could happen,” says Bobby Lehman, an educational technology specialist with the Boulder Valley School District in Colorado. The tablet lets teachers push different apps to each grade level to give students a unique, individualized learning experience. According to Julie Stewart, the team lead for grades 2 and 3 at Colorado’s Challenge to Excellence Charter School, the Nexus 7 can even hone fine motor skills. She paired the device with a stylus to help a student who was struggling with small movements. “It was really amazing to see how a different tool was able to allow the student to learn,” Stewart says. Jeremy Pearson, supervisor of IT for the Fort Dodge Community School District in Iowa, said educators there rolled out 1,000 Chromebooks because the device best fit the typing needs of third- through 12th-graders. But the Chromebook’s keyboard isn’t the only reason schools deploy the device. 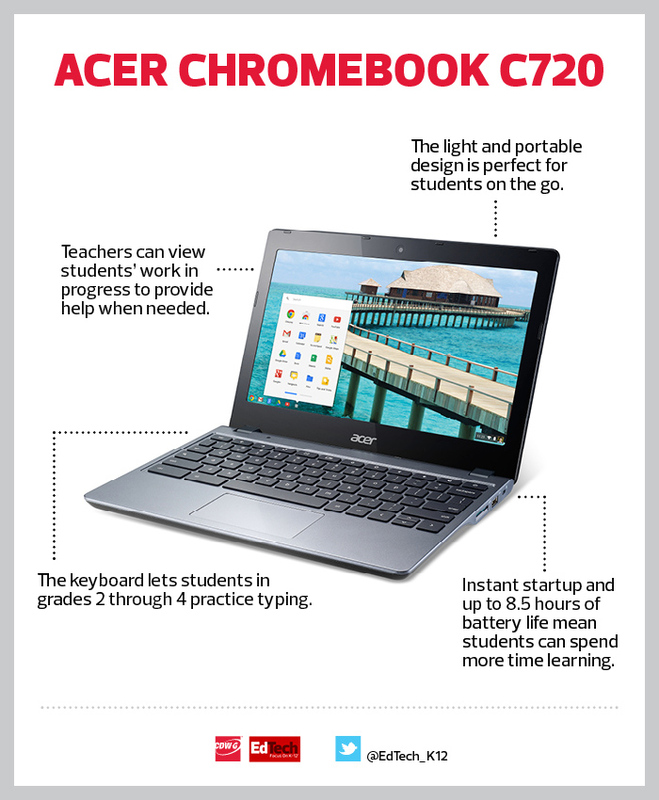 As a cloud-based platform, the Acer Chromebook C720 lets classmates and faculty collaborate, communicate and work online. The lightweight device also travels easily so students can carry it home and then submit homework via the cloud. IT staff, meanwhile, don’t have to spend as much time managing and provisioning the devices, thanks to the Chromebook’s use of near-field communication. 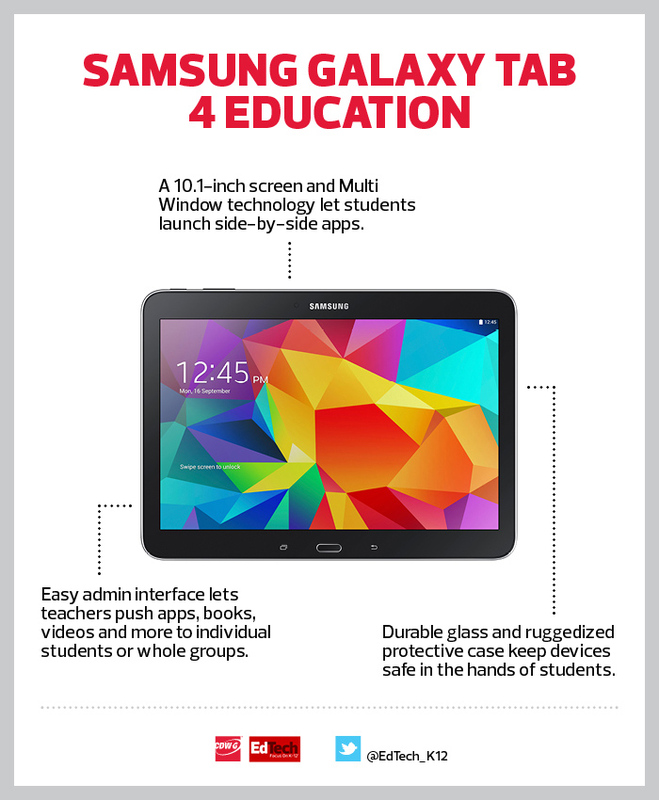 Learning has no boundaries, thanks to the Samsung Galaxy Tab 4 Education. The 10.1-inch display and Multi Window technology mean students can view multiple Google Play for Education apps at once. Up to 10 hours of battery life enable all-day use, while the device’s charging port can be hooked up to a single tablet management station to reduce classroom clutter. Fort Dodge’s Jeremy Pearson says the Galaxy Tab 4 Education’s easy admin interface eliminates the need for third-party mobile device management. Without much instruction, teachers are able to push apps to students via near-field communication technology and view students’ progress midlesson.